Antiquor? Imperiorum Tabula, in qua prae coeteris, Macedonicum seu Alexandri Magni Imperium et Expeditiones. 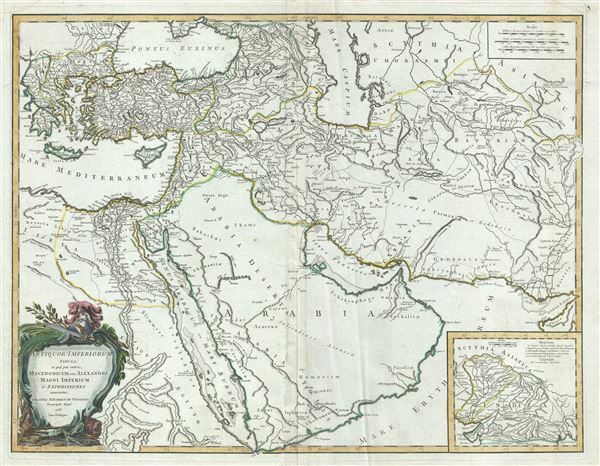 This is Robert de Vaugondy's spectacular 1753 map of the Middle and Near East including Arabia, Asia Minor and Persia showing the expeditions of Alexander the Great. It covers the Middle East and the Arabian Peninsula spanning from the Black Sea to the southernmost extension of Arabia and west, inclusive of Persia, as far as the Gulf of Kutch and east to include Greece. An inset in the lower right quadrant details the northern regions of India and the Asiatic Scythia, along with notes of the explorations of Alexander the Great. Vaugoundy created this map to illustrate the campaigns of the Macedonian King Alexander III, called 'the Great,' conqueror of the Persian Empire and at just thirty, ruler of one of the largest Empires in history. Alexander the Great was undefeated in battle and is considered one of the most successful military commanders of all time. The map also notes the route for the march of Alexander, inland through Gedrosia. Alexander lost a huge number of soldiers and supplies during this march through the desert. Vaugondy employs all of the latest geographical information of the time incorporating both French and transliterations Arabic place names. This map offers splendid detail throughout inclusive of undersea shoals and reefs in the Red Sea and Persian Gulf, mountain ranges, lakes, rivers, and historical sites. A highly decorative title cartouche by Groux appears in the lower left quadrant. Drawn by Robert de Vaugondy in 1753 and published in the 1757 issue of his Atlas Universal. Very good. Original platemark visible. Original centerfold. Minor spotting. Water stains along top margin, not effecting printed area. Rumsey 3353.003. Pedley, Mary Sponberg Belle et Utile: The Work of the Robert de Vaugondy Family of Mapmakers, 382.